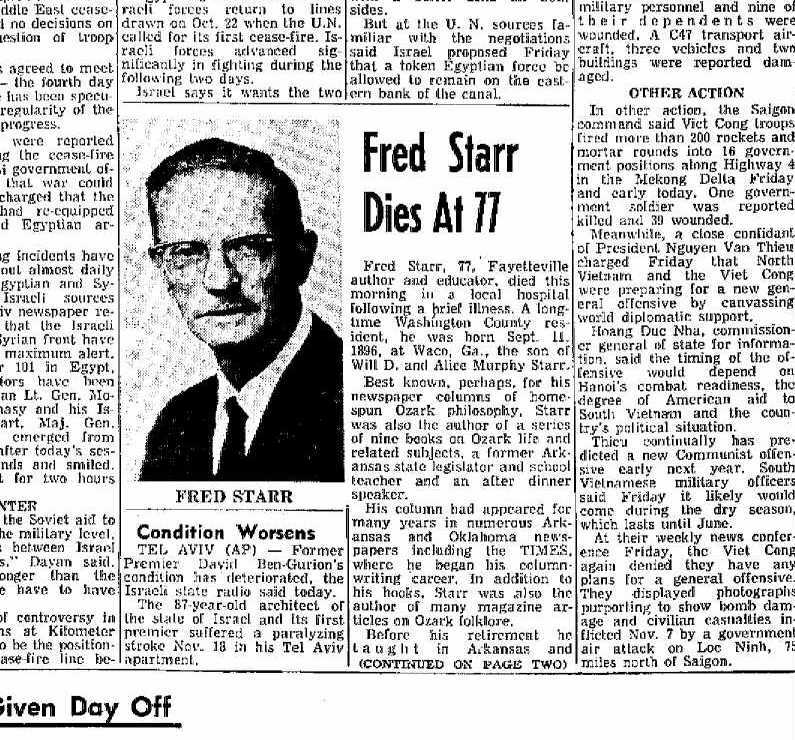 Probably most students who attended Fayetteville, Arkansas public schools in the late 1950’s and early 1960’s remember Fred Starr as “Mr. Starr,” the substitute teacher. Mr. Starr and Mrs. Shepard were the two most frequent substitutes during my years at Hillcrest Junior High School, and others knew them as substitute teachers at Woodland Junior High and Fayetteville High School. They were quite a contrast: Mr. Starr was quiet and dignified, a bit aloof and very sober. Mrs. Shepherd, as sweet as ice tea in August, overwhelmed you with the deepest Southern accent imaginable. When encountering Mr. Starr in the classroom, I knew that he was a minor local celebrity who wrote a weekly column in the Northwest Arkansas Times (NWAT), but I did not fully realize or appreciate the extent of his accomplishments. By the late 1950s, he had already had been writing a newspaper column for thirty-or-so years, had authored several books, had served two terms in the state legislature, had been principal of a Farmington school and superintendent of the Elkins school district, and was a well known and respected amateur folklorist. Saving the details of his life for a longer biographical article, the following is a brief sketch of his life. When I was but a child my father contracted itching feet and there has always been much moving in the family. Why, I can remember we used to move so often when the chickens saw us coming to catch them they just walked up and crossed their legs. 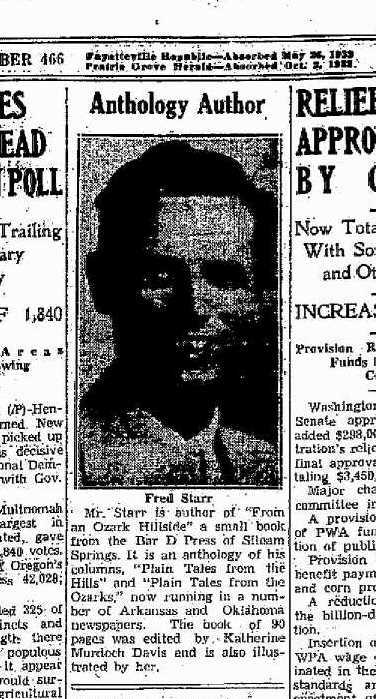 Starr moved to Northwest Arkansas sometime in June, 1935 and made a living as a writer and an educator. He married Florence Lillian Clark, and they made their home in Greenland until the early 1940s. They had three children, Jon Larry, Joe Fred, and girl who died in infancy (he wrote a moving "Letter to Heaven" soon after her death; it was published in his book Gifts from the Hills (pp. 22-25). 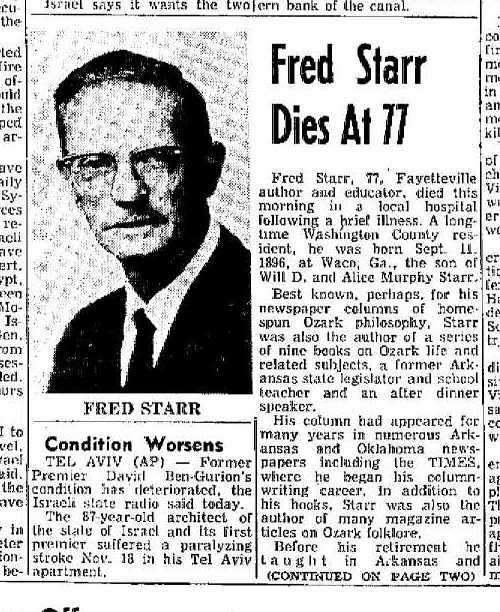 Fred Starr must have spent much of his time roaming the Ozarks collecting stories and wisdom from folks living in the mountains. The focus of his writing was on their life, speech, music, beliefs, customs, superstitions, and ways. The information in his columns was often cited by the famed Ozark folklorist Vance Randolph and others. I am not sure when he started writing a newspaper column, but a search shows his columns were published in the NWAT in 1937 (I don't have access to earlier issues of the paper). According to Randolph, Starr's early columns appeared in the Fayetteville Democrat, which existed until the late 1920s His column was first called "Plain Tales of the Hills," then "Plain Tales of the Ozarks." In 1940, the name was changed to "Hillside Adventures." His columns were published not only in the NWAT, but also in the Tulsa World and other papers in Arkansas and Missouri. He continued writing a column, on and off, for the NWAT until his death in 1973. I do not have information on Starr's educational background, but his work as an educator began in the 1940s. Starr taught at Farmington's new school in the early '40s, and was principal of that school from 1944 to 1947. In the middle 1940s, he taught commercial law, English, business math, and accounting at the Fayetteville Business College. 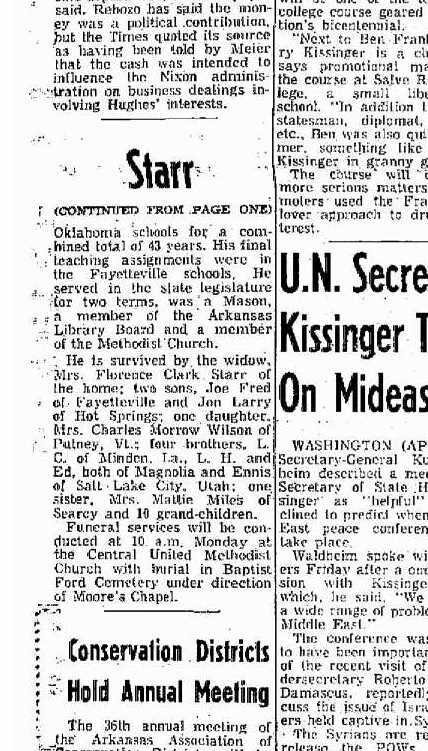 In 1948, he was appointed to be superintendent of the Elkin’s school district, a post he held for several years. In 1954, Starr was elected to represent Northwest Arkansas in the state House of Representatives. He served two terms in that office. As I mentioned at the beginning, Fred Starr was often a substitute teacher in the Fayetteville school system, and perhaps others, in the late 1950s and in the 1960s. These years were also his most productive as a writer. Starr died on November 24, 1973, at the age of 77. His obituary is below. ...[T]hese hills of ours are grander, more satisfying for those who know them, thanks to Fred Starr's having taken the time to help us understand them. In that respect, he was a teacher of uncommon perception, a conservationist ahead of his time, and a folk artist of all too rare a quality. Professor H.O. Davis's "Fayetteville Business College" at 309 West Dickson (which is now a part of Webster Universtiy) causes a bit of ambiguity for readers. It is often confused with the Business College of the University of Arkansas at Fayetteville, Arkansas.